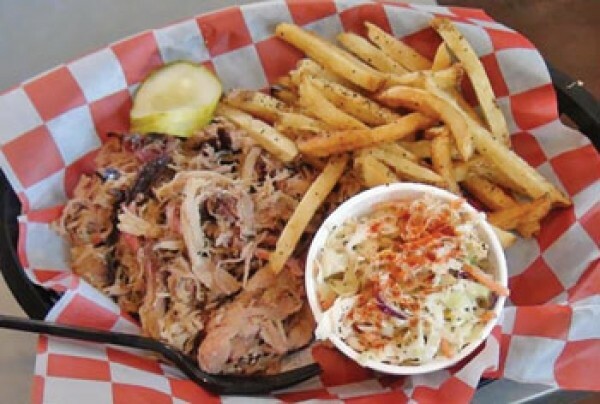 It didn’t mean much to some people, but the sight of a cast-iron smoker in the parking lot of a West Jordan convenience store set the hearts of barbecue aficionados fluttering. And when it was gone, it provoked similarly deep pangs of loss. Rick Bylsma, originally from Perry, Utah, started doing barbecue 10 years ago with a competition trailer at the Harmons parking lot in Kearns. He moved to the Vernal oil fields, but returned to the valley at year ago and started up Yo Mama’s Smokin’ Good BBQ in the Circle K on 7200 South near Jordan Landing. Yo Mama’s success became its south-valley customers’ misfortune, as Bylsma was doing well enough there to make a move. He purchased the Front End Grille, on the corner of 500 West and 200 North, next to the Rail Event Center, because “the deal was right.” The building retains the Front End signage for now, and the restaurant has added breakfast items, as well as burgers and sandwiches carried over from the West Jordan location. But the self-taught Bylsma’s specialties come from the smoker: pulled pork, beef brisket, chicken, sausage, and ribs that fall right off the bone. He uses his own rub, and a barbecue sauce that adds just the right tanginess and zip. It’s a refreshing change from barbecue joints that become victims of their own popularity and turn to “assembly-line” production, sacrificing slow-smoked flavor to more speedily crank out the ’cue.